From animated cartoon shorts to full-length episodes, “The Simpsons” has entertained, enlightened, and embiggened the world for more than twenty years. No television program has managed to satirize society, impact popular culture, nurture the imaginations of multiple generations, rewrite the rules of scripted comedy, inflame sentiments, cross the proverbial line, enrage its critics, embrace morality, reflect humanity, become an international phenomenon, and just plain make people laugh quite like “The Simpsons,” and there is no end in sight for this historic series. SIMPSONS WORLD The Ultimate Episode Guide is a cromulent compendium of the creative innovations that have made and continue to make Homer, Marge, Bart, Lisa, and Maggie Simpson the iconic and ideal family to the world at large. 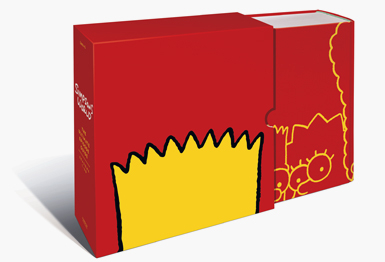 This 1,200-page, full color assemblage of every episode from the first twenty seasons includes thorough episode synopses, famous quotes and quips from all your favorite characters, memorable moments, over four hundred character profiles, every song ever sung by the citizens of Springfield, every “D’oh” or “Mmm...” Homer has ever uttered, every chalkboard phrase Bart has ever written, every couch gag, every marquee message outside of the First Church of Springfield, a complete filmography of “Itchy & Scratchy,” a tribute to star of stage and screen (and infomercial and filmstrip) Troy McClure, the largest collection of Krusty the Clown merchandise outside of Bart’s bedroom, a barrage of your favorite sight gags as well as those you may have missed, trivia galore, a complete list of celebrity guest stars, and much, much more. Packaged together in the ultimate wraparound slip case and weighing in at almost 10 pounds, SIMPSONS WORLD The Ultimate Episode Guide is pound for pound and page for page the fullest and funniest book on the face of the Earth. Matt Groening, creator of “The Simpsons,” presents an all-encompassing encyclopedia and lovingly assembled lexicon that puts the whole Simpsons world in your hands and everything you ever wanted to know about the longest-running animated show and sitcom in television history at your fingertips. IN STORES OCTOBER 26, 2010!